Project DTO released the final report of its vision for downtown Orlando to the City Council on Monday, May 4. Consisting of 100 volunteers, Project DTO was a taskforce called upon to assess Downtown Olando’s strengths and weaknesses and then recommend ways to improve our City. The volunteers came up with over 100 ways to do just that, and the board appears ready to act! The task force, which is charged with creating a strategic plan for the next 10 years for downtown Orlando, estimated the cost to revitalize Orlando, and make it a destination to live, work and play, as much as $445.2 million. But that price may not be locked down. The project could change in terms of cost and may be funded via various pots of money such as Community Redevelopment Agency funds, partnerships and other sources, said Heather Fagan, a spokeswoman with the City of Orlando. The group wants to help make downtown Orlando more appealing to businesses and locals by simplifying permitting and fee processes, attracting emerging chefs and restaurants, promoting urban farming and local food hubs and more. A number of the ideas focused on improving pedestrian safety and fostering new business. There are hundreds of recommendations in this report on how to make Downtown Orlando better, but what will be done first? “What I hope is always foremost in everyone’s mind, is looking at those things that connect to each other and connect us to downtown,” said board Co-Chair Fred Kittinger. Orlando Mayor Buddy Dyer is signaling his willingness to do just that, taking a look at transportation and revitalization projects at a street level, possibly beginning with Robinson Street. “I think that road is over capacity and with fast speeds,” said Mayor Dyer. Commissioner Patty Sheehan thinks it is a top priority to make the road more pedestrian and bike friendly. The plans show fewer lanes, wider sidewalks, a bike lane, and a grand entrance to Lake Eola. Mayor Buddy Dyer also has his eyes on completing another long term goal. A new area under Interstate 4 from Robinson to South Streets that would be called “The Under I” area. He has a task force working out the details, but described what he would like to see to FOX35. 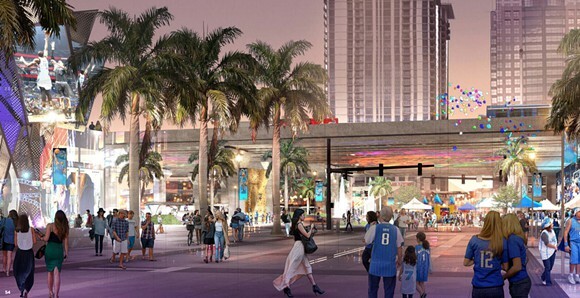 “Recreational areas, something that draws people from both the east side of I-4 and the West side of I-4 to congregate, to gather under I-4. Something that is a 24 hour a day experience. Transform Magnolia into a pedestrian corridor. 2-lane overhaul of Robinson Street.